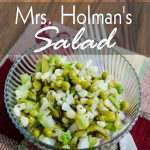 If you love peas, corn and green beans, you will love this cold salad called Mrs. Holman’s Salad. Another great recipe from my mom geared for a healthy heart to serve to my father. I have no idea where the name came from. Makes me wonder if it wasn’t handed down to her from one of her beauty shop customers or in one of her old hometown cookbooks. Someday I will ask. 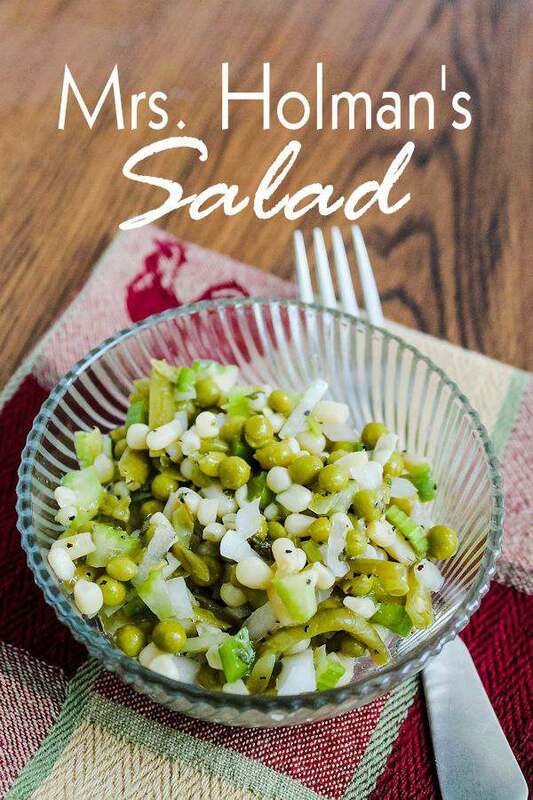 The recipe is very specific about using Le Sueur peas, Shoepeg corn and French Cut green beans. I have made this recipe in a pinch and used regular corn and peas and the flavor just wasn’t the same. I love the texture of the smaller veggies. I don’t make this salad that often because the peas and corn don’t go on sale very often, but when it does, I stock up for the summer. It’s crunchy, fresh and the vinaigrette dressing is tangy and sweet all at the same time. To make it more colorful, you can use red bell peppers or pimentos. I’ve made this before for a Christmas party when we had to bring red and green food. I love making an oil and vinegar based salad during the summer because if I take it to a party, it can sit out for awhile and I don’t have to worry about it going bad quickly like a mayo-based dressing can. Perfect for picnics. Add salad ingredients in a bowl and pour dressing over the top and toss. Let cool in the fridge before serving. I have also used red bell pepper or pimentos for a touch of red. So yummy Tammy. Just pinned it! Yum! Salads = summer! This is a new one to me.